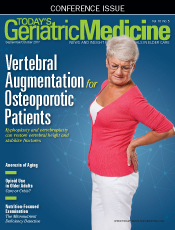 Geriatric physicians should include vertebral augmentation as a top choice for patients with osteoporosis who suffer from a vertebral compression fracture. As we grow, osteoblast cells (the builders) in our bones generate new bone tissue at a faster rate than the osteoclast cells (the destroyers), which break down bone tissue. Therefore, our bones grow stronger and stronger, denser and denser, hitting peak bone mass usually in our mid-20s to mid-30s with hormones regulating the rate of the entire bone-rebuilding project. Around this age the rate at which the osteoclast cells break down bone tissue eclipses the rate at which the osteoblast cells build new tissue, meaning that bone mass gradually lowers from this point on. While the gradual decline in bone mass is unavoidable, all kinds of factors can speed up or slow down these rates, ranging from diet and physical activity to smoking and alcohol consumption. Additionally, several commonly administered medications may inadvertently reduce bone mass. The most common fracture caused by osteoporosis occurs in the spine and is called a vertebral compression fracture (VCF). While the other two common locations for osteoporotic-type fractures are in the hips and wrists, VCFs in the spine are twice as likely to occur, afflicting 700,000 patients each year.3 Not all VCFs are caused by osteoporosis, but the disease greatly increases the risk. The 24-vertebrae presacral spine is like a 24-story building, anchored into the pelvis to support the upper body. Each floor of the building stacks upon the next. A VCF can occur when the building absorbs external compression—something like a traumatic accident can be the culprit—but as the bone mass weakens, the structure of the building becomes more brittle and is less resistant to compression, meaning that activities as simple as twisting or sneezing can cause a fracture. Oftentimes, this fracture occurs in the front of the vertebrae, causing the vertebrae to collapse forward, making patients shorter and giving them a hump in the spine. The spine then begins to lean forward, causing severe pain through the nerves that run out of the spinal canal. Patients who suffer from a VCF have a few options for treatment. For those with healthy bones, long periods of rest can allow the fractures to heal, oftentimes supported by a brace and physical therapy. This is normally considered the conservative treatment because it is a more passive approach. But the result is anything but conservative for geriatric patients with a VCF who suffer from either low bone density or osteoporosis. In older adults the bone tissue will not regrow as quickly as it would in a younger patient, and long periods of rest (usually lying on the back induces less pain for VCFs) can cause additional problems such as a pneumonia or a dangerous blood clot. While the aforementioned decrease in physical activity is problematic, equally consequential are the social implications. Elderly patients with VCFs are increasingly isolated and are forced to rely on relatives and other caretakers for many activities of daily living. The long periods of inactivity can be disheartening, lowering patients' confidence in their ability to recover. And because the conservative approach requires more regular medical visits, patients who struggle with mobility are frequently forced to arrange alternative transportation from others, lowering their independence. Fortunately there is a better option for many geriatric patients with VCFs. While a brace and resting can allow the bone to heal itself, oftentimes a physician needs to restrengthen the bone from the inside. Some of the best treatments for geriatric patients fall under the umbrella of vertebral augmentation, with procedures known as kyphoplasty and vertebroplasty. The minimally invasive outpatient procedure called kyphoplasty can restore vertebral body height as well as stabilize the fracture by injecting a bone cement called polymethylmethacrylate into the affected region of the spine. Vertebroplasty is a similar procedure utilizing a cement injection but not restoration of the vertebrae. In both procedures, physicians use either local anesthetic or sedation to maintain comfort for patients, using real-time X-ray imaging to ensure the proper amount of cement is being injected in the affected region. The cement hardens in minutes, providing pain relief and returning stability and enhanced body motion back to the patient, who is usually able to return home the day of the procedure. Complication rates have been estimated to be less than 2% for osteoporotic VCFs,2 making kyphoplasty a minimally invasive and safe surgery for reducing pain and improving quality of life scores for patients. Who Are Candidates for Vertebral Augmentation? It should be noted that all patients have their own stories, so it would be unwise to generalize that all patients with VCFs should have kyphoplasty. The general candidates for the surgery are patients who would be unlikely to return to normal health on their own, which includes most elderly osteoporotic VCF patients, as their bone mass is too weak. When patients present the symptoms of acute pain that limits activities of daily living with focal tenderness and an exam indicating a compression fracture, an MRI is the gold standard (and a requirement) for determining whether they are candidates for vertebroplasty. For patients with pacemakers, a combined CT/bone scan is the proper alternative. If there is no abnormal marrow edema associated with the compression fracture or sacral insufficiency fracture, then they are not candidates. It is worth keeping in mind that there are contraindications including spinal cord edema if there is severe retropulsion of bone and there is severe canal stenosis with associated neurologic deficits. Since it was first performed in the United States in the early 1990s, medical studies have been testing the efficacy of vertebroplasty. The literature has been overwhelmingly positive for both the safety and effectiveness of the surgery for decreasing pain and increasing quality of life. A study titled "Safety and Efficacy of Vertebroplasty for Acute Painful Osteoporotic Fractures (VAPOUR)" published in 2016 in Lancet tested the effectiveness of vertebroplasty for patients with VCFs presenting within six weeks of receiving the fracture who reported pain rated at least 7 out of 10 on the Numeric Rated Scale (NRS).5 They tested vertebroplasty against a second group of patients with the same inclusion criteria, with the only difference being that the second group received a placebo procedure. The scientists were meticulous in their inclusion criteria and consistent in their process for the study to be credible. Within 14 days, 44% of patients in the vertebroplasty group reported their pain to have decreased to a 4 out of 10 or less on the NRS, compared with only 21% of patients in the placebo group who had equal results. At six months after the procedure, the results were 69% and 47% reduction in pain for the vertebroplasty and placebo groups, respectively. Perhaps the most important statistic was that vertebroplasty patients reported an average 6.1-point reduction in pain compared with 4.8 points for placebo patients on the NRS at the six-month mark. An earlier 2013 meta-analysis of several studies confirms similar findings of the VAPOUR study. The conclusion of the meta-analysis was that vertebroplasty results "in greater pain relief, functional recovery, and health-related quality of life than nonoperative or sham treatment." Later the meta-analysis concluded that "the benefits of vertebroplasty over conservative treatment were seen at the very early times of one and two weeks and remained significant at one year. "6 After a fracture VCF patients grow accustomed to constant pain, making relief from their pain and the ability to maintain activities of daily living the most important outcomes of vertebroplasty. Furthermore, vertebral augmentation also can lower the mortality rate caused by a VCF. A 2011 study looked at mortality rates of more than 850,000 patients in the Medicare population, comparing patients receiving conservative nonoperated treatment with patients who had received either vertebroplasty or kyphoplasty.7 The study found that after four years, nonoperated patients had a mortality rate of 50% compared with 39% for operated patients. Two prior outlier studies have attempted to discredit the efficacy of vertebroplasty for reducing VCF pain, commonly referred to as the Buchbinder8 and Kallmes9 studies published in 2009. Their findings attempted to show no difference in pain reduction between vertebroplasty and conservative nonsurgical treatments. Since their publication, both studies have been discredited. Whereas the VAPOUR study is careful in its inclusion criteria and the consistency of its treatments, the Buchbinder and Kallmes studies are less credible and were downgraded in the 2013 meta-analysis from Level I to Level II study quality.6 In the placebo groups, the studies used lidocaine as a sedative for the sham treatment, a numbing agent that could provide real pain relief for the fracture. In the case of the Kallmes study, patients did not have to complete an MRI before the study to determine conclusively whether the pain was from a VCF, and the inclusion criteria for the study was only a minimum 3 out of 10 on the pain Visual Analog Scale. Because of the lack of credibility of these two outlier studies, their findings are not representative of how effective vertebroplasty can be for patients with VCFs. What Should Physicians Tell Patients? Vertebral augmentation is a safe and effective treatment for osteoporotic patients with VCFs, particularly at the earlier stages of a fracture before it causes other complications. The surgery is minimally invasive and has a high success rate for reducing pain and restoring function. If a patient has acute pain limiting activities of daily living with focal tenderness, then an MRI will be necessary to determine whether the pain is caused by a VCF. Geriatric physicians should include vertebral augmentation as a top option for osteoporotic patients with spinal fractures. Conversely, while it may not be the right solution for all, patients should talk to their physicians about whether or not vertebral augmentation is the right treatment for their situation. — Joshua Tepper, MD, is a diagnostic radiologist with Presence St. Joseph Medical Center in Joliet, Illinois. 1. What is osteoporosis and what causes it? National Osteoporosis Foundation website. https://www.nof.org/patients/what-is-osteoporosis/. Accessed July 7, 2017. 2. Vertebral compression fractures. American Association of Neurological Surgeons website. http://www.aans.org/en/Patients/Neurosurgical-Conditions-and-Treatments/Vertebral-Compression-Fractures. Accessed July 7, 2017. 3. Osteoporosis and spinal fractures. American Academy of Orthopaedic Surgeons website. http://orthoinfo.aaos.org/topic.cfm?topic=A00538. Updated January 2016. Accessed July 7, 2017. 4. Lau, E, Ong K, Kurtz S, Schmier J, Edidin A. Mortality following the diagnosis of a vertebral compression fracture in the Medicare population. J Bone Joint Surg Am. 2008;90(7):1479-1486. 5. Clark W, Bird P, Gonski P, et al. Safety and efficacy of vertebroplasty for acute painful osteoporotic fractures (VAPOUR): a multicentre, randomised, double-blind, placebo-controlled trial. Lancet. 2016;388(10052):1408-1416. 6. Anderson PA, Froyshteter AB, Tontz WL. Meta-analysis of vertebral augmentation compared with conservative treatment for osteoporotic spinal fractures. J Bone Miner Res. 2013;28(2):372-382. 7. Edidin AA, Ong KL, Lau E, Kurtz SM. Mortality risk for operated and nonoperated vertebral fracture patients in the Medicare population. J Bone Miner Res. 2011;26(7):1617-1626. 8. Buchbinder R, Osborne RH, Ebeling PR, et al. A randomized trial of vertebroplasty for painful osteoporotic vertebral fractures. N Engl J Med. 2009;361(6):557-568. 9. Kallmes DF, Comstock BA, Heagerty PJ, et al. A randomized trial of vertebroplasty for osteoporotic spinal fractures. N Engl J Med. 2009;361(6):569-579.